Nigeria’s foreign trade report for imports and exports during the third quarter of 2015 has shown an unprecedented decline reflecting the level of stress the economy has witnessed since this year. A huge drop in crude oil export appeared to have taken a toll on the ability of the economy to finance imports as the Central Bank of Nigeria, CBN, tightenned its restrictions of foreign exchange utilisation within the period. According to the foreign trade statistics released by National Bureau of Statistics, NBS, compared to the corresponding quarter of 2014, the value of total merchandise trade comprising Nigeria’s imports and exports in third quarter 2015 decreased by N2.5 trillion or 38.3 per cent. Total value of trade in the third quarter of 2015 was N4.02 trillion as against N6.4 trillion in the corresponding period of last year. This, according to the report, was as a result of a N132.4 billion or 7.3 per cent and N 2.4 trillion or 50.3 per cent decline in imports and exports respectively relative to the corresponding quarter in 2014. The third quarter 2015 reports also show steady decline in the economy sector as the value dropped by N338 billion against the preceeding quarter of 2015. Quarter-on-quarter, the sharp decline in exports and slight decrease in imports contributed to continued fall in the Country’s trade balance, by 32 per cent or N 303.1 billion during the third quarter of 2015. Total value of Nigeria’s imports during the quarter stood at N1.7 trillion, a slight decrease of one per cent from what was recorded in the preceding quarter, but, year-on-year analysis showed that the country’s imports decreased significantly by N132.4 billion or 7.3 per cent, reflecting the siginificant difference in the economic conditions between the periods. Total value of the nation’s exports totalled N 2.3 trillion in the third quarter of 2015, a decrease of N320.6billion or 12.1 per cent, over the value N2.65 trillion recorded in the preceding quarter. This decline, according to NBS, was attributed to a fall in crude oil exports by N372.8 billion or 18.8 per cent over the preceding quarter. The structure of Nigeria’s imports by section was dominated by the imports of “Boilers, machinery and appliances; parts thereof” which accounted for 24 per cent of the total value of imports in the third quarter of 2015. Other commodities which contributed noticeably to the value of imports in the review period were “Mineral products” at 15.3 per cent, “Vehicles, aircraft and parts thereof; vessels etc” at 8.8 per cent, “Products of the chemical and allied industries” at 8.6 per cent, and “Base metals and articles of base metals” at 8.4 per cent. Imports classified by Broad Economic Category, revealed that Industrial Supplies “ranked first with N470.3billion or 27.9 per cent of total imports. This was followed by “Capital Goods and parts” with the value of N398.7 billion or 23.6 per cent, and “Food and Beverage” with N322.8billion or 19.1 per cent. The value of Motor Spirit (petroleum products) stood at N220.6 billion. Nigeria’s imports by direction (country of origin), showed that the country imported goods mostly from China, United States, Belgium, Netherlands and India which respectively accounted for N459.4 billion or 27.2 per cent, N160.6 billion or 9.5 per cent, N128.3billion or 7.6 per cent, N101.8billion or 6 per cent and N97.4billion or 5.8 per cent of the total value of goods imported during the quarter. Further analysis of Nigeria’s imports by continent, revealed that the country consumed goods largely from Asia with imports valued at N764.5 billion or 45.3 per cent of total imports while it imported goods valued at N596.4 billion or 35.3 per cent from Europe and N241.3 billion or 14.3 per cent from the Americas. Import trade from Africa stood at N65.4 billion or 3.9 per cent while imports from the region of ECOWAS amounted to N16.3 billion. The structure of exports is still dominated by crude oil, which contributed N.6 trillion or 69.1 per cent to the value of total domestic exports in the third quarter of 2015. Natural liquefied gas recorded N265.2 billion of the total export value during the period under review. Exports by section revealed that Nigeria exported mainly “Mineral Products”, which accounted for N2.025 trillion or 86.8 per cent of the total exports. Other products exported by Nigeria include those catigorised as “vehicles, aircraft and parts thereof; vessels etc.” at N216.2 billion or 9.3 per cent; “prepared foodstuffs; beverages, spirits and vinegar; tobacco” at N33.1 billion or 1.4 per cent, and “vegetable products” at N9.3 billion or 0.4 per cent of total exports. The Central Bank of Nigeria, CBN, is now to allocate foreign exchange to end-users, with priority given to matured Letters of Credit, importation of petroleum products, raw materials and machinery. This is in a bid to effectively manage the nation’s depleted foreign reserves. 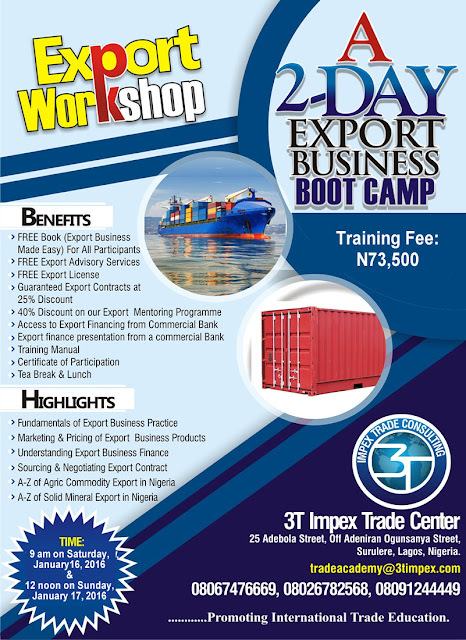 This came as Nigeria’s foreign trade report for imports and exports during the third quarter of 2015 has shown an unprecedented decline reflecting the level of stress the economy has witnessed since this year. The Director of Monetary Policy of the CBN, Mr. Moses Tule, who spoke in Abuja, at the weekend said under the new regime, those who take pleasure in wasting the nation’s foreign exchange in shopping abroad would find it increasingly difficult. His words: “Our priority as a nation for the allocation or use of foreign exchange is for the settlement of matured Letters of Credit, LCs, that have been opened for importation; for the importation of petroleum products until such a time when we have our refineries fully operational and we are not in a position to import fuel again to ensure that the wheels of economic development continue turning and running and for the importation of raw materials. “By the time we meet these three priority areas, you will discover that people who are using their debit cards overseas for shopping can never be on the priority list. The director said that the CBN synpathised with Nigerians on the ban of the use of debit cards abroad but that there was nothing the institution could do on its own to change the nation’s foreign exchange earnings, as it largely depends on oil receipts. “It is a healthy development where Nigerians can no longer use debit cards abroad. But it is inconvenient. Right now the country is going through very difficult times because of developments in the oil market. Foreign exchange under the condition Nigeria has found itself has become a seasonal commodity. Seasonal in the sense that it depends on the movement of the price of oil. If oil prices are high, then we build reserves, if oil prices are low, then we have no reserves and we will be in a crisis situation. “Does the CBN sympathize with the situation Nigerians find themselves not being able to use their debit cards outside the country? Yes the CBN certainly does sympathize with the hardship Nigerians are facing, but can the CBN stop it? The CBN cannot stop what the banks are doing now and the reason is very obvious,” he said. Mr. Tule indicated that the policy would not be reviewed any time in the short term, as according to him, the reserves which currently stand at about $29 billion would have to be built up to a figure of around $50 billion before free use of the foreign exchange could be restored. The state of Plateau is among the states in Nigeria that is currently running on deficit according to BudgIT. This is really unfortunate because this state is among the few in Nigeria that has a double in the sense that it has huge deposit of solid minerals with export potential in addition to its agricultural potential. Plateau state has no reason to be in this financial mess. However, the people on the plateau have found themselves in this predicament because their leaders have not learnt how to harness the state potential in both agriculture and solid minerals to generate enough revenue to meet her obligations. This article therefore was written to show the state a way out in practical sense with the numbers that are well researched and not just speculation on what could be done. This article is a departure from what our leaders are used to. They make promises of projected internally generated revenue and jobs to be created. They give us numbers which have no foundation, no basis and are therefore not realistic and we the citizens have failed to ask the question "HOW". We are usually indifferent and do not bother about the specifics. Then, they get elected and begin to tell us their challenges and why they cannot fulfil their promises. The time has come for us to begin to tell the leaders what they need to start doing in order to redirect their various states to the path of economic progress. 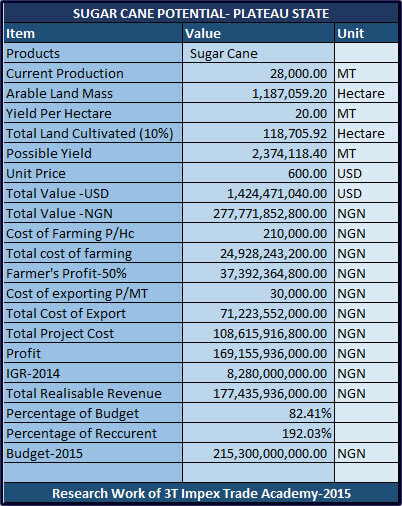 In this article, we will be examining how the farming and exporting of sugarcane can help plateau state to generate N170 billion in revenue if the government can commit just 10% of its arable land to the cultivation of this agricultural commodities. Let me also point out that the facts raised in this paper are based on the data obtained from different research done by Central Bank of Nigeria, National Bureau of Statistics, Ministry of Agriculture and some universities in Nigeria. 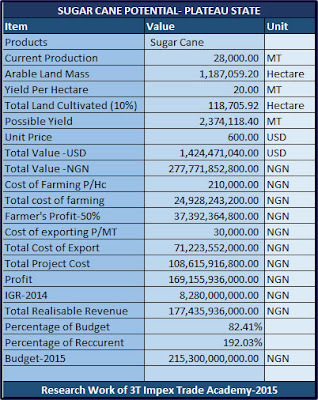 With a yield of 20MT per hectare, this means that the state can produce 2,374,118.40MT of sugarcane on the land size stated in the assumptions above. If this sugarcane is exported at a free on board (FOB) price of USD600/MT, the total proceeds will be USD1,424,471,040.00. Using a conversion rate of N195 to 1USD, this amount to N227,771,852,800.00. The unit cost of farming sugarcane and exporting are N210,000 per hectare and N30,000 per MT respectively. The total cost of farming plus 50% profit on the sales to the government (or to the trading company engaged by the government) comes to N37,392,364,800.00 and the total cost of exporting (transport, documentation, freight forwarding etc) comes to N71,223,552,000.00. The total project cost (farming and exportation) will be about N108,155,936,000.00. The estimated profit that can accrue to the state on this project comes to about N169,155,936.00. According to data obtained from government sources, the IGR of the state for the year 2014 was about N8,280,000,000. from the analysis we have done on farming and exportation of sugarcane, the state could grow her revenue by about 2000% from this source alone. 5. Buy the farm produce from the farmers on credit and pay them upon receipt of export proceeds from buyers abroad. 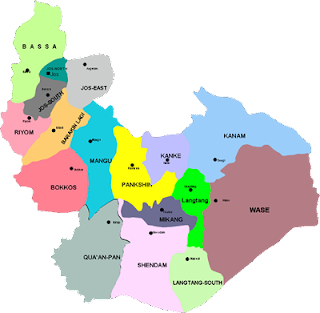 We strongly believe that if the government of Plateau state can adopt this commodity as a means of revenue and implement the strategies suggested, it will naturally rebound the economy of this state to the part of greatness within a years, the state also becomes self-sufficient and numerous job will also be created as collateral benefits. Exports from Africa were worth US$552 billion in 2014, up 11.3% since 2010 but down 5.8% from 2013. African exports represent an estimated 3% of total world exports which were $18.7 trillion during 2014. Based on statistics from the International Monetary Fund’s World Economic Outlook Database, the total Gross Domestic Product for African countries amounted to roughly $5.486 trillion in 2014. Therefore, exports account for about 10% of Africa’s total economic output. Given Africa’s population of about 1.148 billion people, the total $552 billion in 2014 African exports translates to roughly $475 for every person on the continent. Below are the top African export countries that achieved the highest dollar value in global shipments during 2014. Also shown is each country’s overall share of African exports.